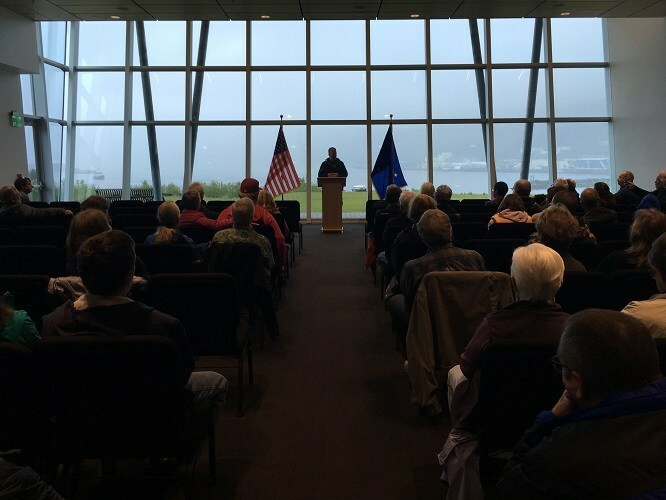 Republican Senator Dan Sullivan held a town hall in the city of Kodiak Saturday and attracted a sizable crowd. He dedicated the bulk of the meeting to the public’s questions, and most focused on healthcare. One commenter, Mike Milligan, said the United States has a health care system based on money. He connected his statement to Sullivan’s support of putting outside funds into political campaigns. In response, Sullivan told a story about a woman who approached him and his family at dinner. The person said she and her husband were paying $3,000 dollars a month under the affordable care act with a $10,000 dollar deductible. Sullivan said they’re working towards reform for the state. Scattered among the many comments on health care were several about protecting fisheries resources. Gina Friccero referred to an incident in 2014 where a massive flow of mining waste in Canada escaped into lakes that served as spawning grounds for sockeye salmon. Sullivan said he believes in responsible resource development and transparency. He discussed the ongoing issue of Pebble Mine in the Bristol Bay watershed. The Environmental Protection Agency recently settled a lawsuit with the Pebble Limited Partnership that allows the company to apply for a federal permit for a mine in the area. He said the permitting process should be fair. At the town hall, Sullivan also spoke about some of the bills he’s started or contributed to, including one to bolster missile defense and another to encourage new entrants into the fishing industry and provide training for young fishermen.